A town has unveiled an "amazing" new Christmas tree after last year's fake one was dubbed "the worst in Britain". The ridiculed tree in Camborne, west Cornwall, did not even make it to the big day as it had to be removed when its star was stolen and wires exposed. Earlier, hundreds watched the switch on of a "beautiful" 25ft traditional spruce. Last year's cone-shaped tree, damaged at least 10 times, was described as "absolutely rubbish". Image caption Mocking around the Christmas tree - last year's effort was branded "absolutely rubbish"
Organiser of this year's big switch-on, Sharron Lipscombe-Manley described the "wonderful real tree" as the centre piece of Christmas celebrations. Camborne resident Chris Gilkes said the previous tree was "absolutely rubbish" but the new one was "amazing". "It's a real tree and it will give more spirit to this place than last year," he said. Image caption The most wonderful time of the year? The 2017 tree was damaged by climbers "at least 10 times"
Michelle Dawson, from nearby Redruth, said: "Last year the tree was a bit embarrassing really - the cone-shaped one, it was awful." She added that last year's vandalism "had its benefits" as "we've got a gorgeous new real tree, and it looks beautiful". 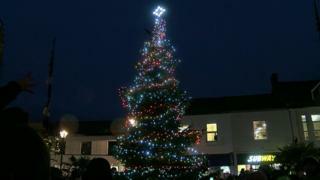 Grace Bown praised the 2018 Christmas tree organisers, saying they had done a "brilliant job" with the tree, which is complete with a new illuminated star.